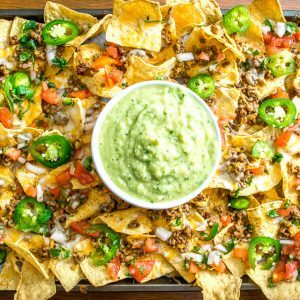 Beef nachos have the potential to become Hollywood’s next superhero: they’re handsome (at least right out of the oven), they know the difference between right and wrong (cheese must be melted but not burned), and they have a superhuman ability to save your day when it’s on the verge of apocalyptic destruction (nachos for dinner?!). Sturdy tortilla chips are your trusted sidekick here, the kind that won’t crack under the weight of your beefy superhero. And if you want to introduce a love interest for your superhero I highly recommend a homemade Avocado Salsa Verde. The key to these nachos is to give the beef real flavor before you add all the fixings; then everything else just becomes a bonus because the combo of spicy ground beef, melted cheese, and warm tortilla chips is already off the charts. 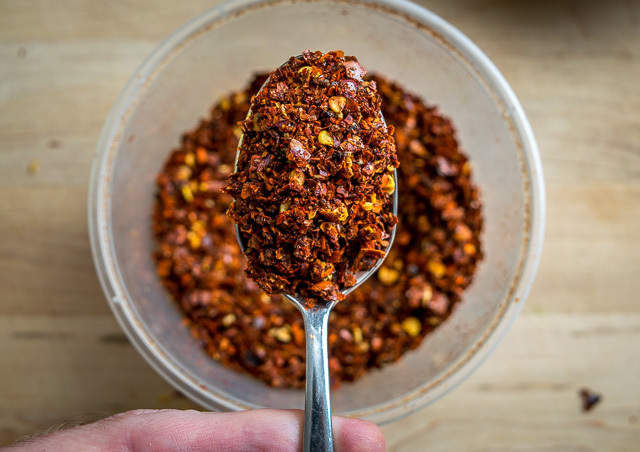 The chipotle seasoning for our Ground Beef Tacos has superhero qualities of its own so we are using a variation of that here today. 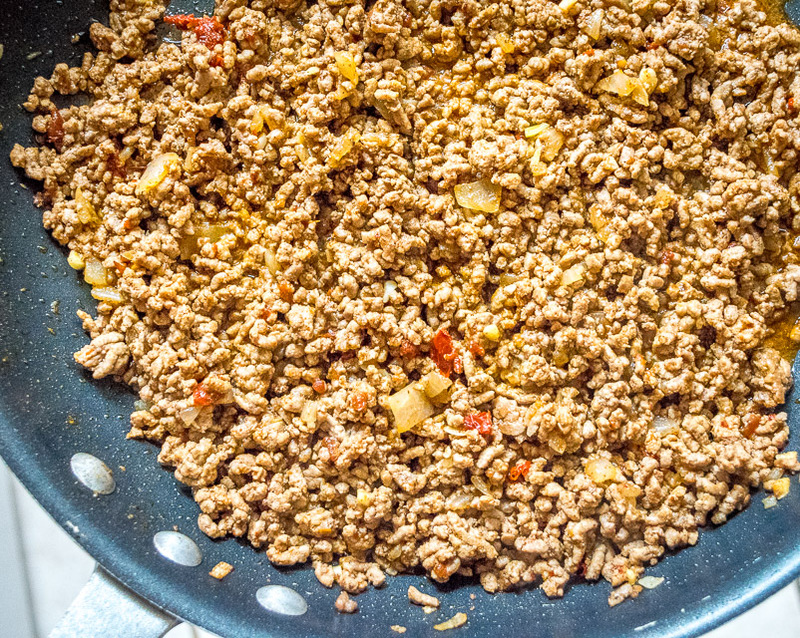 Chipotles give the ground beef incredible flavor and will instantly have you thinking of other ways you can use it. Start by finely chopping 1/2 an onion and saute over medium heat for a few minutes. Add 1 lb. ground beef and cook until browned. Once browned you can drain off some fat if you want to, I usually do. Add 2 minced cloves of garlic to the beef and saute briefly. Meanwhile, scrape the seeds out of two chipotles in adobo and mince them up. 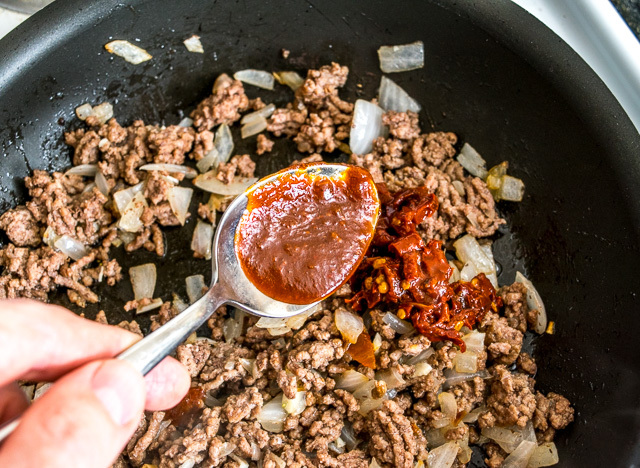 Add to the ground beef along with 1 Tablespoon of adobo sauce from the can of chipotles. I also add 2 Tablespoons of crushed New Mexican chile. 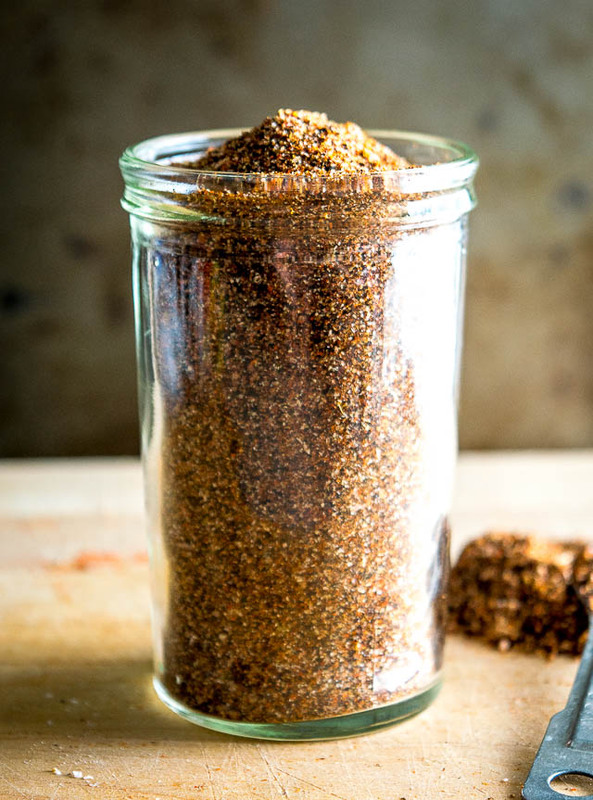 It’s a bit chunky so 1-2 Tablespoons of traditional chili powder is a good equivalent. Add 1/2 teaspoon salt, freshly cracked pepper, 1/2 teaspoon cumin and 1/4 cup of water. Mix well and let simmer for a few minutes. It’s best to keep the beef moist because it will dry out a little bit in the oven, so feel free to add a few more tablespoons of water if necessary. Give a taste for seasoning. If you can’t stop eating it you are already there! I added an additional pinch of salt to this batch along with another dash of cumin. These nachos seem to work best when built as a single layer. Yes, you’ll have enough beef for two layers and can easily create a double layer masterpiece, but I find that those behemoths get soggy too quickly. So we’ll create a dense, single layer of chips and cover it with half of the beef and plenty of shredded cheese. This gets baked in the oven at 400F for 5-7 minutes or until the cheese is thoroughly melted. 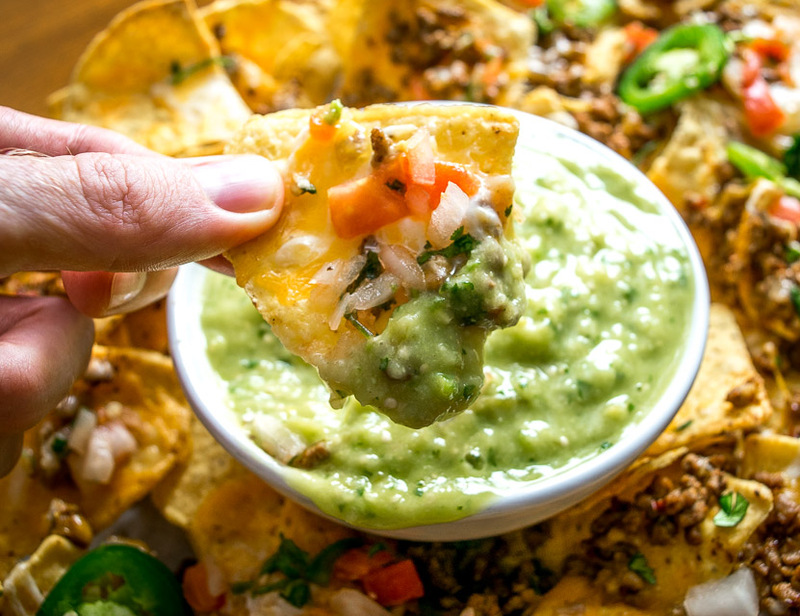 A little pre-planning goes a long way with the fixings because you want them ready the exact moment the nachos come out of the oven. I’m using a double batch of our Pico de Gallo as a topping. And as mentioned, the ideal love interest for your beefy superhero is a fresh, cool Avocado Salsa Verde. Dipping a warm, cheesy chip into this delightful green sauce can work wonders on people so consider yourself warned. I’ll put instructions for both of these fixings in the recipe box below. Feel free to get creative with additional garnishes like jalapeno slices, cilantro, and a drizzle of Mexican Crema if you think you deserve it. 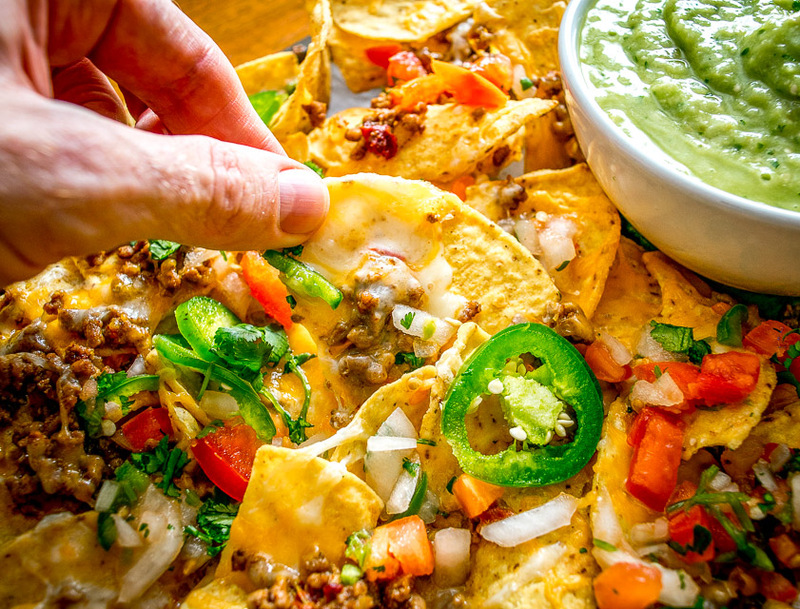 Nachos have a minuscule half-life so you have full permission to eat them voraciously. But don’t fret if they go quick, you’ve got enough for another single layer batch. Beef nachos to the rescue! Cue triumphant music. 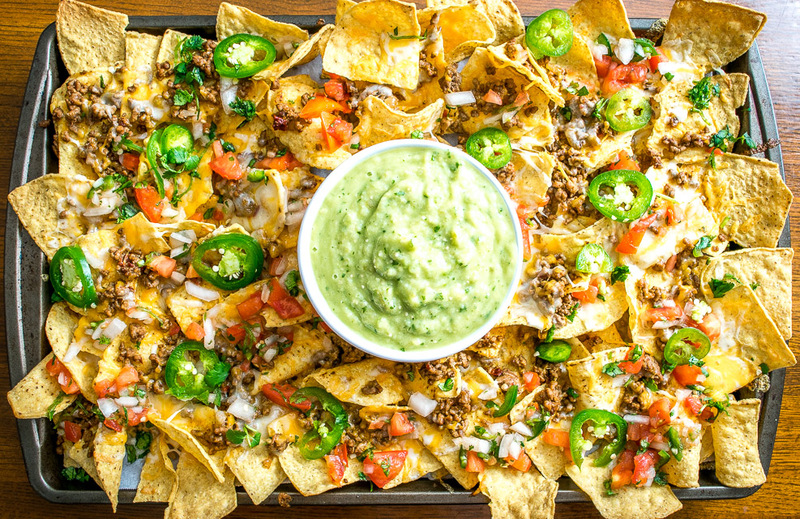 These Spicy Ground Beef Nachos have the potential to save your day. Chipotles in adobo give the beef real kick and when loaded on cheese covered tortilla chips they quickly become a go-to meal. Roughly chop ½ onion. Saute onion in a dollop of oil over medium-high heat for a few minutes. Add 1 lb. ground beef and cook until browned. Drain any fat if you want. Add 2 cloves minced garlic and saute briefly. 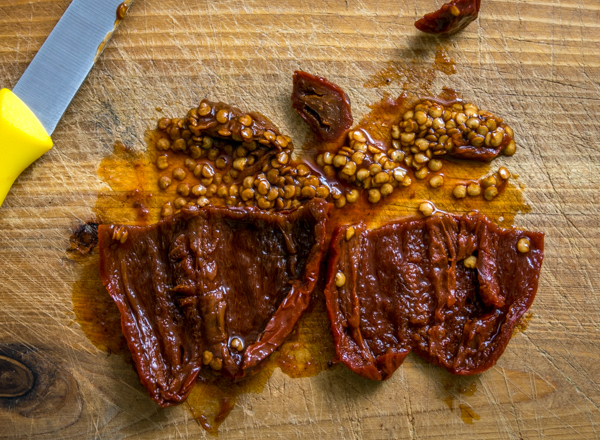 Scrape the seeds out of 2 chipotles and mince them. Add chipotles and 1 Tablespoon adobo sauce to the beef. Add 1 Tablespoon chili powder, 1/2 teaspoon cumin, 1/2 teaspoon salt, freshly cracked pepper, and 1/4 cup water. Simmer for a few minutes but try to keep the beef moist. Taste for seasoning (I added additional salt and cumin to this batch). 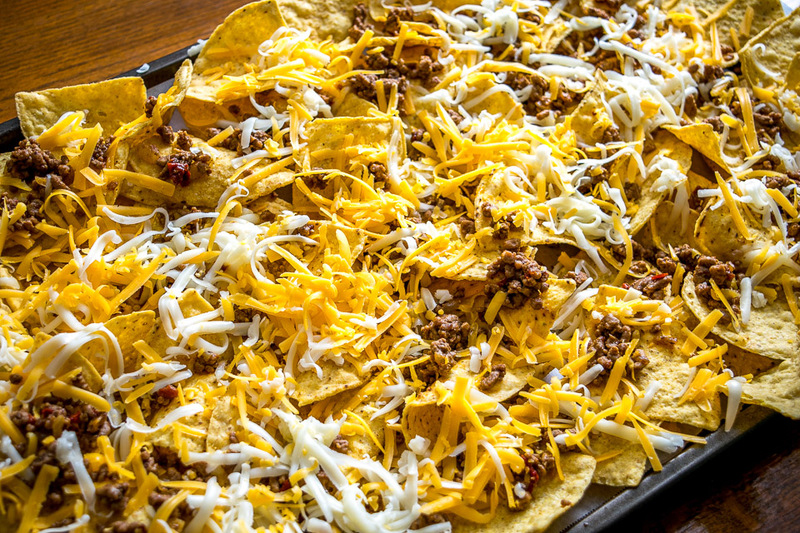 Create a single, dense layer of tortilla chips on a sheet pan. You can line the sheet pan with parchment paper for easier cleanup. Add half of the beef mixture and plenty of shredded cheese to the tortilla chips. Bake at 400F for 5-7 minutes or until cheese is thoroughly melted. Top with your favorite fixings and serve immediately. If you are making Avocado Salsa Verde, start by rinsing four fresh tomatillos. Roast the tomatillos in the oven at 400F until cooked through and they start to turn army green. Add the roasted tomatillos to a blender along with ½ onion, 1 garlic clove, 10-12 sprigs cilantro, and ½ of a jalapeno pepper. Pulse blend and taste for heat, adding the additional ½ of the jalapeno if you want more heat. 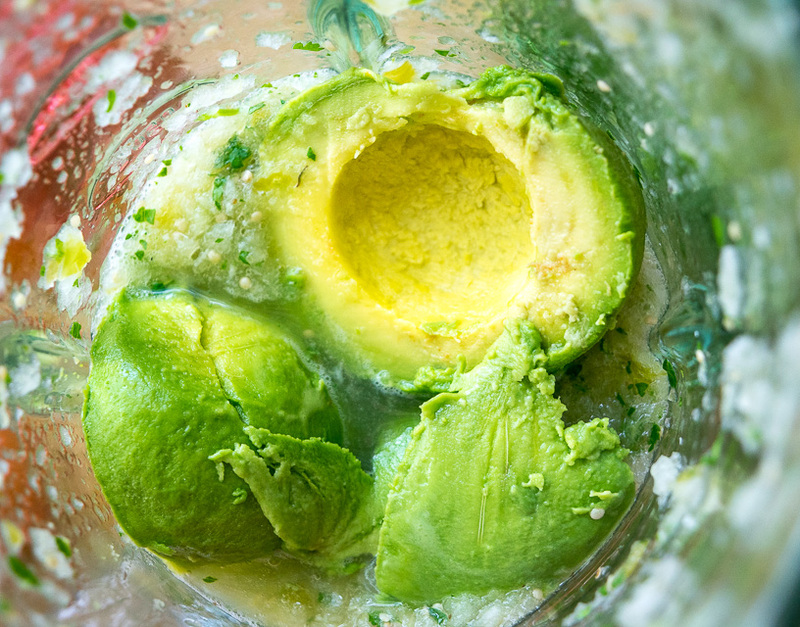 Add the avocado to the blender and combine well. Salt to taste. 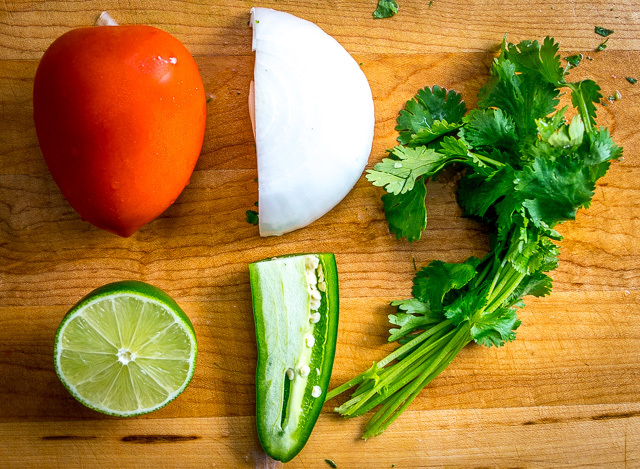 If you are making Pico de Gallo, start by finely chopping the tomato, ¼ onion, and ½ jalapeno into ¼" sized chunks. Finely dice the cilantro. Combine the tomato, onion, jalapeno and cilantro in a mixing bowl. Add ¼ teaspoon salt and the juice of a ½ lime. Mix together well and taste for seasoning. Add additional salt and lime if necessary. As the beef simmers, feel free to add additional tablespoons of water to keep it moist. There is enough beef to make two layers. You can make a double layered version but I prefer to make a single layer at a time. You could also substitute some of our homemade chorizo for the beef. Details on how to make it here. And if you’re in a pinch you can always use some homemade taco seasoning for the ground beef.